A Tonk's Tail... err, Tale...: Wordless Wednesday: Talk to the Tail! Can you tell whose this is? that we said goodbye to Ryker. It is a very tempting tail to play with. We love the tail. Have a wonderful wordless Wednesday. purrs to all of you!! Oh, dear, we're sorry. Such anniversaries are hard. We gave you an award on our blog. Ryker sure was a good looking cat ! FaRADaY: wanna hint? It belongs to the smartest, most handsome kitteh in the fambly. We think that's Faraday's tail (of course, we just read his comment right above ours, MOL)! 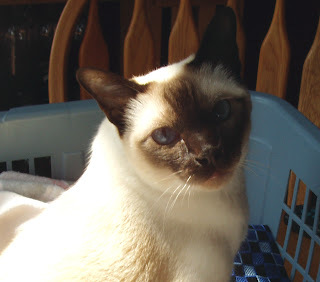 Sending you hugs and comforting purrs on this sad anniversary of your sweet Ryker going to the Bridge. Sadly, I did not know Ryker (he was before my blogging days) but he sure does look like a handsome boy! We know it's Allie's tail - what a gorgeous, wiggly tail it is too. We hope your good memories of Ryker now fill your days. These are the type of anniversaries that are hard. Sending purrs today. I love that wiggly tail! Hugs for loving Ryker memories that make your hearts smile. The way that tail is flinging around, I've got to give it to FaRADay. I remember Ryker...and it is always so hard to see their beautiful faces and remember tham while longing to hold them again. My Admiral's 1st year anniversary will come up December 15th. What a great picture of Ryker. Sending purrs and hugs. He was such a beautiful boy! I adore the tail animation! :) purrs for your heartache..
Beautiful Ryker. My human is mesmerized by the blue eyes...and the tail up top. Makes us smile! Awwww, I missed Ryker during the pawty yesterday. I bet that tail belongs to Allie. Not. We send you purrs as you remember handsome Ryker on this day. I just know Ryker is watching over all of you! What a handsome kitty! I didn't know you when Ryker was part of your family. So sorry that you lost him it is always heartbreaking!!! Farady, you are funny! Tell your human I am sending her some purrs today. She is probably a little sad. These anniversaries can be hard. Thank you so much for your kind words about Herman. The blog will continue with Spyro and Oja. Oh kitty! I want to play with that tail! Sending loving wags to you. Can we join the queue for a turn at tail tapping? What a stunning picture of Ryker, we know it still smarts in your heart. We bet he sends continuous purrs down from OTRB to make your heart feel better. Love the tail swish, we can relate!